Big changes are in the pipeline for Tamaki Dr and the final stage of the Glen Innes to Tamaki Dr path. 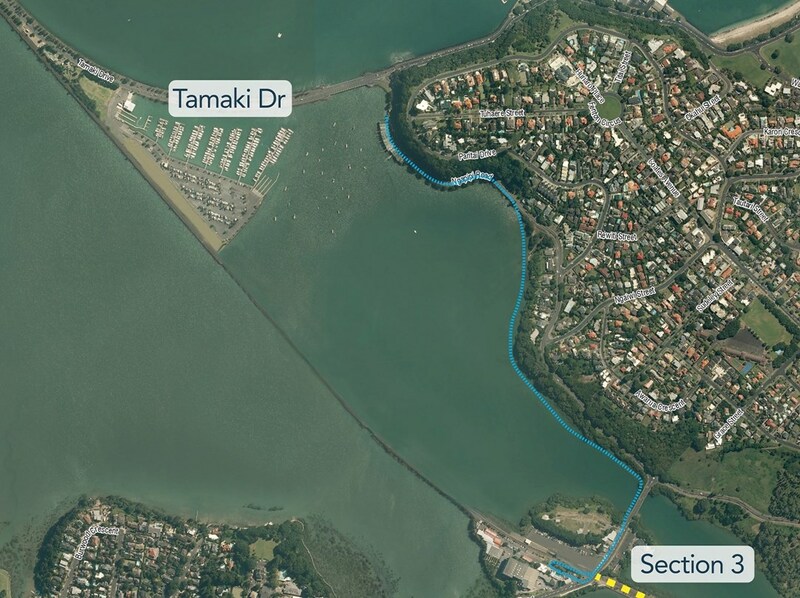 The changes to Tamaki Dr come following feedback from an earlier consultation while AT are consulting on the design of GI to Tamaki Dr path along a longer, and more inconvenient route around the eastern edge of Hobson Bay. AT consulted on the design for Tamaki Dr between The Strand and the Ngapipi intersection a few months ago. Consisting of shared paths on either side of the road was far from ideal. Our friends over at Bike Auckland couldn’t support it resulting in them suggesting a different solution. This is largely what Auckland Transport have agreed to implement. They now plan to extend the protected, bi-directional cycleway of Quay St along the Northern side of Tamaki Dr to the Ngapipi intersection, with the exception of a section between The Strand and Solent St). At Ngapipi it will connect to the GI to Tamaki Dr project. AT plan to widen the bridge immediately west of the Ngapipi intersection with 2.5m wide clip ons on either side. Essentially the existing shared path on the northern side of the bridge will become the cycleway while the clip on will be the new footpath. As part of these works, AT also plan to raise Tamaki Dr by up to half a metre and change the curve on the seawall to help deflect waves and prevent flooding which has been an issue. 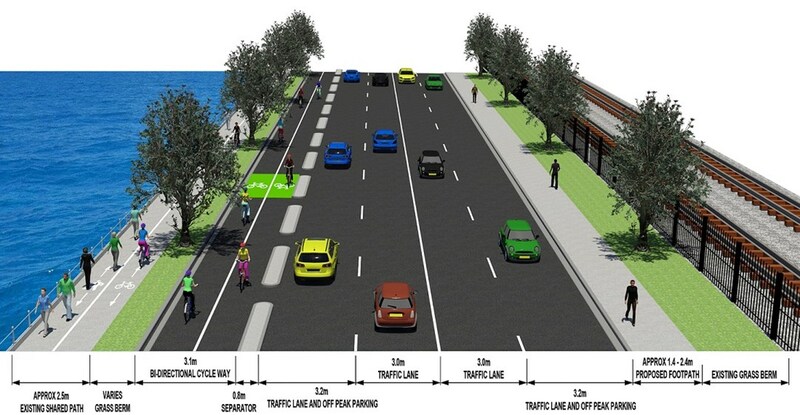 Overall this seems like it will provide a much better outcome for Tamaki Dr, which is Auckland’s busiest bike route. As you can see in the first image and the one below, the new 4m wide boardwalk is now planned to hug the eastern side of Hobson Bay. 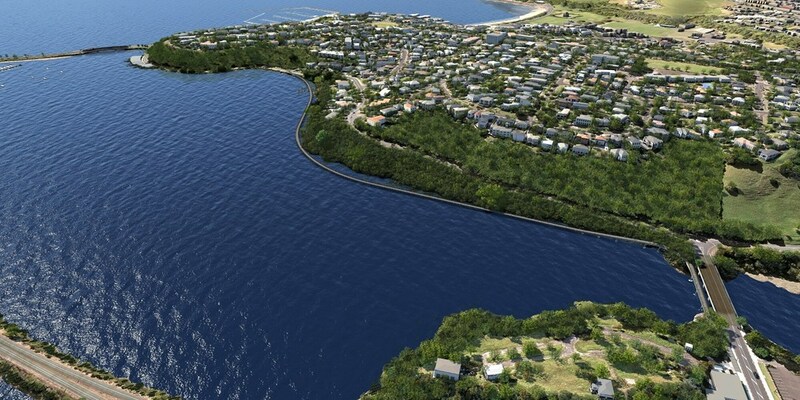 The project had initially been intended to follow the rail line straight across the bay alongside the rail line but this new route will be much less direct for those heading to the city, adding over 700m to the journey. The flip side to this is that it will be easier for those wanting to reach the eastern beaches. Wednesday 20 September, 7am to 10am at Lilliputt Mini Golf car park, 3 Tamaki Drive, Parnell. Saturday 23 September, 8am to 11am, Orakei Bay Village, 228 Orakei Road, Remuera. I think it’s a huge shame that people won’t be able to glide out across the middle of the bay. While this shouldn’t be the only criteria, that feels like it would have been a much more iconic experience. The path across the bay isn’t the best, but the biggest issue will be the long 2 stage crossing with small island at the new Ngapipi Intersection, and the remaining shared path segment at Solent to The Strand. The new hobson bay path by the shoreline (not rail) is actually a very nice stretch of native bush leading to Whakatakataka bay just prior to Ngapipi intersection. Its only an additional 700M if going to the city which really isn’t that much on a bike – walking yes but realistically why are people going to walk into the city – too far, just catch the train. so works for cycle commuters and scenic walkers. 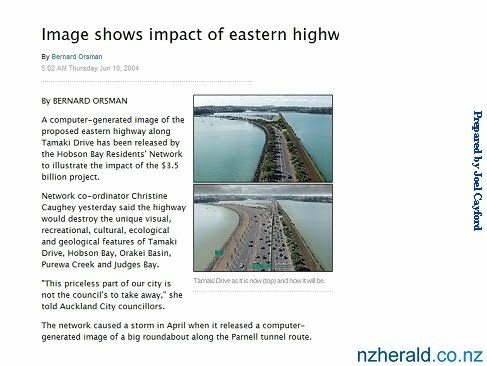 The issue with Tamaki drive raising is that the causeway road is sinking into the mudstone, the weight compresses it over the years. 0.5 m raise is a temporary fix because the real height it needs to be is the same as the rail line which will be a substantial fix in years to come .. The rail line has already been raised to future proof for sea level rise of at least 1m by end of century, check the levels next time you are there. I cycle commute this route a lot, seldom do you see pedestrians on the west (non seaward) side. having the 2 lane on road cycleway there is good – if you are head down moving then it will work well. If you want a leisurely scenic ride then go on seaward side and slow down in the mixed walking/cycling. It should have a 10km/hr speed limit for cyclists as a sharing speed. Cycling on the road currently feels very unsafe! As I saw in a Twitter conversation, the wind you would probably get across the rail corridor could get at times would be a negative factor. I’m really starting to think with climate change (probably due to our recent weather & Gulf of Mexico hurricanes) that we need to be designing Auckland’s infrastructure with a lot more on and off again rain & wind in mind sadly. +1, riding along the railway in a strong southwesterly or northeasterly (our most common wind directions) would be awful. Would it really be any worse than what you experience going along the exposed bits of Tamaki Drive now? True. That’s really a neither here or there factor. One of the real reasons for the Ngapipi route is the costs and legal and practical difficulties of building a boardwalk path cantivelered high enough over Outboard Boating Club land so that the OBC could still store boats below (and despite some people – including me at one stage – being of the opinion that the OBC don’t own the land in question, it has become apparent that they do – or have a long term lease – so its not like they are blocking a public land path, the path would need to go onto their land). So once the extra costs and difficulties are included – and considering the cycleway budget is over-subscribed, and AT needs to build it next year or lose the money – they went with this option. Its not perfect on all counts, but it’s a workable, sensible route in my view. There’s a lot more of Tamaki Drive to the East of Ngapipi Ave – it would be nice to see some improvements along there too. Can someone fill me in with what is currently East of Ngapipi Rd Intersection, is Street View up to date? There is a short section of painted lane heading west towards the intersection from where the transit lane stops. Then there’s cycle lanes around the Kelly Tarlton corner (where Jane Bishop died) and in some isolated places (mainly across intersections) further east. For most part the facilities east of Ngapipi will stay the choice between an on-road riding situation and a sub-standard shared path for now. But these new designs will set the minimum standard for future works a lot higher. OK thanks, yes it was the transit lane & the overly simplified “tamaki-dr-creating-connections-map.dbf” that confused me. It seems that by choosing the Ngapipi option AT have avoided a stoush with the OBC, but could end up having one with the owners of the boat sheds due to the limited space for a shared path and parking between the sheds and the road. Understand that early investigations have found that the path will be viable through there. Might need to move the road a metre or so closer to the cliff to get more space on the shed side? From an experiential viewpoint, we already have a path alongside the rail tracks, over water (Orakei Basin). We don’t have an over water, cliff/coast hugging, under the pohutukawa type of experience for path users in this area. We do have an over water, through the mangroves near Palmers Shore road.. Might be nice for a change and the extra distance isn’t too much of a distraction. Biggest issue is the Ngapipi/Tamaki Drive intersection, getting from this proposed path to the north side of Tamaki Drive – in a convenient manner. True, but the previous designs had a crossing at Solent Street, which, while technically single-stage, by no means would be automatically faster (at Ngapipi, the main flows will alternate between west-east on Tamaki Drive, and side road flows from the signalised slip lane. Hopefully that will allow relatively significant bike cycle times on the corresponding adjacent half of the crossing movement). OK I’m confused by the plans & seems only limited bits of plan on their website. 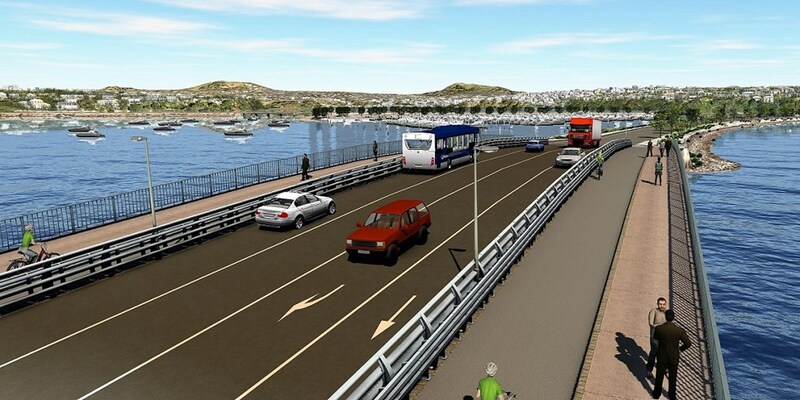 Is the south side of the bridge going to be a shared path or just a path? Think I’ve figured it out, south side on the bridge is shared kind of during construction..but didn’t click that south side ends up with no cycleway just after the bridge heading towards the city…so you either go on path, road or cross? The south side will also get clip-ons, so there will be a cycle-only path (westbound only*) and a pedestrian-only footpath. *Basically to provide westbound *road* riders with a safe way through the bridge pinch point. After that they will be in the general lane again. It’s miles better than now, removes the climb up Ngapipi. Probably takes a few mins off my CBD to Howick ride home from work. With section 3 presumably removing the slog up Kepa Road, it’s all good. Flip that’s a big scary ride at present; will be even better once the AMETI stages done as well. I only do it one way, I take the ferry from Half Moon Bay in the morning, ride home. It’s not that bad. I can do it in 1 hour 10, as a moderately fit 40 something. With the cycle path completed I reckon I can take it close to an hour. It’ll be faster than driving. AMETI will make a difference for sure. Makes sense, would give sweat free arrival at work I guess. Do you use the route that would Lunn Ave on the bike home & at peak time? This bike path project was always promoted on the basis of continuing the existing (and impressive) boardwalk parallel with the rail line from Meadowbank to Orakei so that it would carry on from Orakei towards Parnell Baths. This new design is much less impressive. As someone who commutes via Kepa Road and Ngapipi Road, the proposed path will not tempt me off the road. A boardwalk to the west of the rail line that continued to the existing footbridge across Tamaki Drive at Parnell Baths and has ramps up to that bridge and also ramps on both sides of Tamaki Drive would get much more use (by cyclists and walkers) and be as iconic as the pink bridge/lightpath has become. This proposal simply lacks ambition. It has a lot of ambition, but cycling still doesn’t get much money in this country, so one option being several million cheaper than a rail line path, especially with an overbridge to a Tamaki Drive north side path as proposed by Bike AKL… well, of course the slightly less iconic one won, because the $$$ pot is almost empty and the rest needs to be used by 2018. Lightpath was a repurposed existing infrastructure, and thus cheaper for more WOW. And of course, we have some advocates saying “spend LESS on these big projects and mor on local bike projects”. Anyway, if you want more ambition, vote for parties that support cycling (which, with John Key’s departure, seems to be mainly Labour and Greens, sadly – no statement from National as to whether there will be a new edition of the Urban Cycleway Fund). Thank you to whoever it was who was responsible for stopping that. What a disgusting waste of money. As a commuter to the city the longer route is worse, and may make this route not worthwhile for me – I’ll probably stick with Tamaki Drive instead. If it must follow the eastern side of Hobson Bay, what about making it more direct by taking a straighter line across the bay rather than hugging the coastline? Perhaps they could build the direct route in future (when demand increases)? Apparently, if they hug the shoreline, it is MUCH more likely to get planning approval, as going straight across the bay would involve much more onerous consents than sticking to the coastline – not an RMA expert, but that’s what I understand – and would be more likely to be opposed by locals up the hill (the shore-hugging version is not visible from most properties that have bay views). Straight, flat and direct is how cycleways should be built. 700m longer with a whole lot of bends is rubbish. It’s probably up and down too. Should have kept to the railway. Wind won’t be any worse than the NW causeway or Tamaki Dr.
Really makes me wonder how many decision makers on this are actually every day cycle commuters, rain or shine. Perhaps the designers are considering people *not* going to the CBD. For example, anyone going between anywhere on the Eastern Line and anywhere in the eastern bays gets a 2km shortcut here. The winding route around Hobson Bay is disappointing but I understand their reasoning. They still need to come up with a better solution for reaching the segregated path on the north of Tamaki Drive though. Two phase crossing is rubbish, especially with a tiny refuge in the middle. To be honest, I think if we’re getting the segregated two-way route on the road there’s no need to keep the northern footpath shared. It’s a bit of a nightmare walking, running or cycling along there and separating cyclists from pedestrians seems like an easy win. Yes, Bike AKL’s proposal was to remove the shared path, and we will keep asking for this. Though you will note that the red fence route along Quay is legally still also a shared path, yet nobody (well, almost nobody) cycles there anymore… – not a biggy, changing it to a footpath will come. Looking at the hearings plans, the refuge currently would fit 8-10 bikes reasonably well, but we (Bike AKL) have already flagged to AT that the stand-up space will need increasing, and that we want to know the proposed phasing to get a feel for typical delays. Did you get any reply about the phasing? I suspect it’s something the Cycling and Walking Team don’t have much control over, and won’t answer about because they don’t want to be held to it. We are still to meet again with them – probably in the next week or two. To me it may make sense to keep the northern side shared footpath until all the construction is complete & probably until the full length of the system is one day done. Perhaps even keep it forever then a very beginner rider and/or families where the children, for example, just have a bike with them can walk/ride together slowly. If the kids were to use the proper cycle path they are likely to clog it up for the faster users. I’m thinking middle aged kids which will likely have wheels above the 300mm limit (or what ever the limits are). Any smaller & they can legally & logically use a footpath anyway. With the proper cycleway in, it’s unlikely regular users would use the inferior shared path anyway? …further to this, training up young riders is important to increase ridership in this city of course. Yes, I think the waterfront paths like Tamaki Drive are the ideal spot for many beginners, including the littlies, and also elderly people wanting to learn how to ride a bike again, or for people who’ve been instructed by their doctors to take up cycling for their physical or mental health. I agree the shared path should be retained for all these important beginners. It seems like a compromise that favours the leisure/weekend cyclist an disadvantages the commuter cyclist. Which will have the greatest impact for cycling in Auckland? I actually think it will be a easier ride because of wind factor alone, the cliff at least gives some shelter most of the time, where following the rail line give you shelter almost none of the time. The separated cycleway on the northern side of Tamaki Drive is good. In terms of Goff’s instructions to reallocate road space to public and active transport modes, how does this design fare? There’s been a bit of road width taken, but no traffic lanes. There’s also been width taken from the shared path on the southern side. And there are the clip ons at the bridge and the new boardwalk, neither of which are re-allocated roadway, but expensive new infrastructure taking cycleway funds from other projects. Just putting it out there… does upper AT management interpret Goff’s instruction to mean that they’ll reallocate road space only if it doesn’t impinge on the traffic flow? Some road space is, in fact, being taken, because there are some sections where currently, even with parking, you have an effective 4 lane environment. In the future, it will be four lanes only outside of parking hours. As for re-allocation of road space generally speaking, I agree that AT is not yet very agressive about this. To be fair, they are getting somewhat more willing to remove car parking, which is also road space, and seems to be in line with their strategies (to remove on-street car parking first, not car travel space). Yes, this is what I’ve observed. I think if Goff had meant just parking space he would have said just parking space. I wonder when he can give them a rark-up. Other countries are using the term “traffic evaporation” after they’ve reallocated road space to other modes – hopefully one day we’ll need to use the term too. One problem I can see with the boardwalk hugging the cliff is it will not get any sun till late afternoon, when it gets damp it will stay damp which will lead to the growth of moss and mold making it very slipery and dangerous no matter how fat/wide your tyres are ,this then becomes a public safety issue ,can the designers be held to account for any losses/damages caused by the poor/bad planning & design which puts people in harms way ? The route by the buy the rail corridor or one out from the cliffs would dry out with the sun or wind and with some thought the hand rail could be designed give you some shelter from strong crosss winds . Slipperyness is a real concern, but its definitely not just going to be your olde “wooden board” boardwalk. Boardwalk really only means “a low bridge above the water”. It may be a form of concrete or asphalt surface, or maybe a composite material. But clearly a sensible comment to make, as we (Bike AKL) will do ourselves.